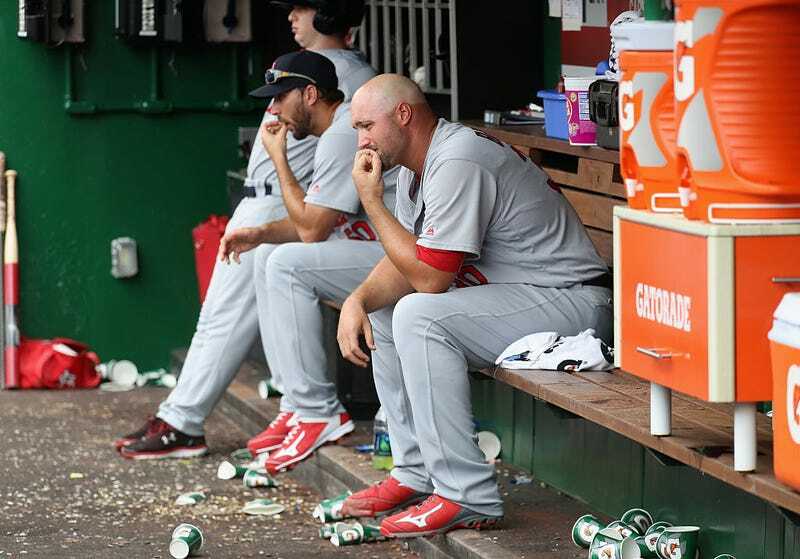 Pitcher Jonathan Broxton sits in the dugout after being pulled in the seventh inning of another Cardinals loss. Via Getty. Stephen Strasburg gave up a single run over his six innings, and the Washington Nationals knocked around the St. Louis Cardinals bullpen late, combining to send the Cardinals to a 10-2 road loss Sunday. The Cardinals opened the scoring in the fourth, when Brandon Moss swatted his ninth home run of the season. The Cards were down just 2 to 3 in the bottom of the seventh when the Nationals lit up relievers Jonathan Broxton and Dean Kiekhefer for five runs on five hits, including a grand slam by Jayson Werth. In picking up the decision, the Nationals ace improved to 9-0 on the year, knotting Strasburg with Chicago Cubs hurler Jake Arrieta for the National League lead in wins. After just 51 games the Cardinals are still hanging in there above .500, so their season is far from over. There’s always the next game!